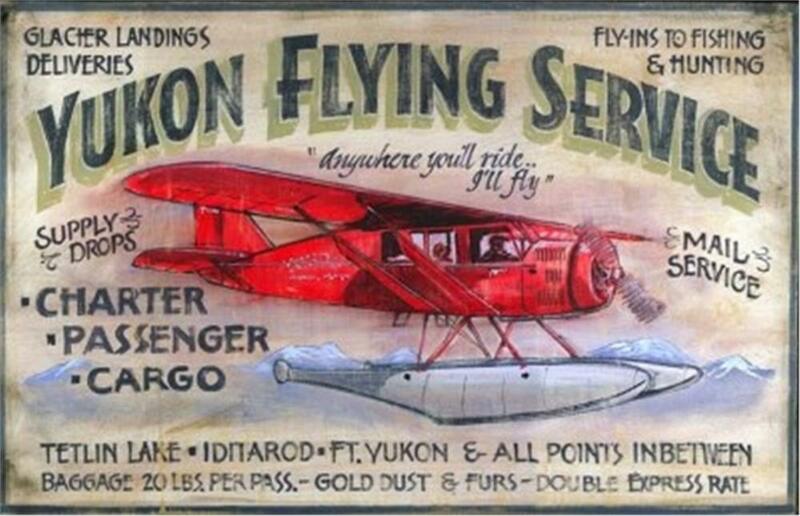 Whether you remember the days of racing at the track or simply enjoying the ride there is no better way to honor those great memories than with this Whether you remember the days of racing at the track or simply enjoying the ride there is no better way to honor those great memories than with this Yukon Flying Service Vintage Metal Sign. Hand-painted designs are reproduced and printed directly on 1/6" aluminum, designed to give a vintage feel and the effect of a rusted metal sign. Handmade so each is a unique piece of artwork! The back of the metal has been coated to prevent rust and tarnish. Each sign is ready-to-hang and made in the USA. Measures 26" x 15". . Hand-painted designs are reproduced and printed directly on 1/6" aluminum, designed to give a vintage feel and the effect of a rusted metal sign. Handmade so each is a unique piece of artwork! The back of the metal has been coated to prevent rust and tarnish. Each sign is ready-to-hang and made in the USA.